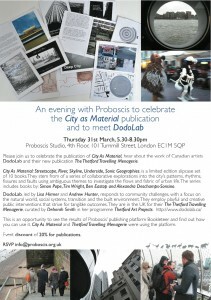 This Thursday 31st March 2011 we’re hosting an evening at our studio in Clerkenwell to launch our first limited edition slipcase set of books published and printed using bookleteer‘s Short Run Printing Service. The set in question contains the 10 books commissioned and produced as part of last Autumn’s City As Material series of urban explorations and collaborative bookmaking. We will also have a special guest, Andrew Hunter of DodoLab who’ll be introducing their recent project The Thetford Travelling Menagerie, which was staged last week in Thetford, Norfolk. 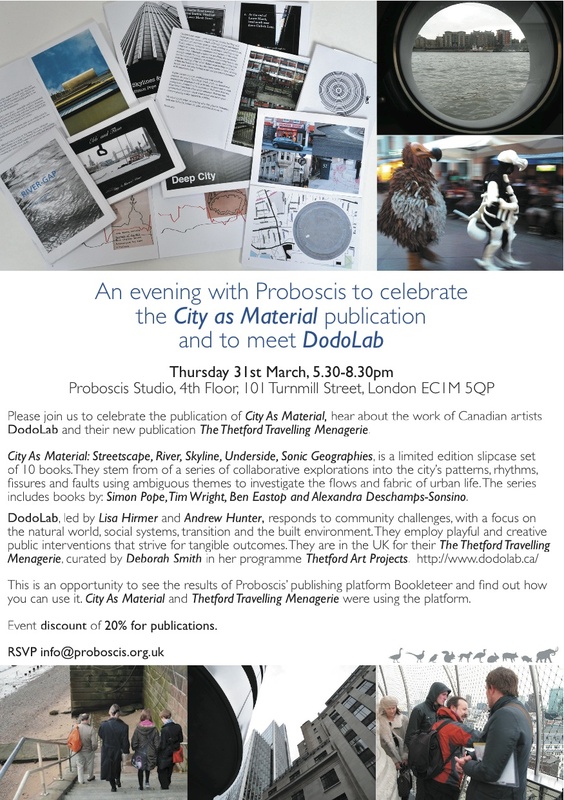 If you’d like to come please email us info at proboscis.org.uk – we’ll have drinks as well as offering a 20% discount off all publications. Or sign up on the Facebook event page. I shall try to come to this on thursday, be very good to see you- how have you been weathering the ACE process….should know by 10 tomorrow i guess.